Wednesday, June 12, 2019 - 7:30 p.m.
Thursday, June 13, 2019 - 7:30 p.m. 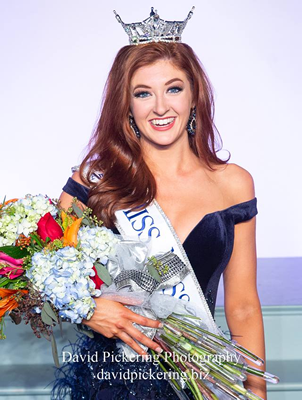 Teen Finals, Friday, June 14, 2019 - 7:30 p.m.
Miss Finals, Saturday June 15, 2019 - 7:00 p.m.
Miss Missouri 2018 Katelyn Lewisnow available to act as an Ambassador, MC, Keynote Speaker, or Entertainer at your organization’s next special event. As our premier, young ambassador, Miss Missouri truly adds dazzling sparkle to the Show-Me-State. The Miss Missouri Pageant would like to thank our Miss America wardrobe sponsors. Copyright 2018. Miss Missouri. All rights reserved, worldwide.